Turns out, it takes more than a mousetrap for the world to beat a path to your door. Check out this post on LinkedIn to read more. 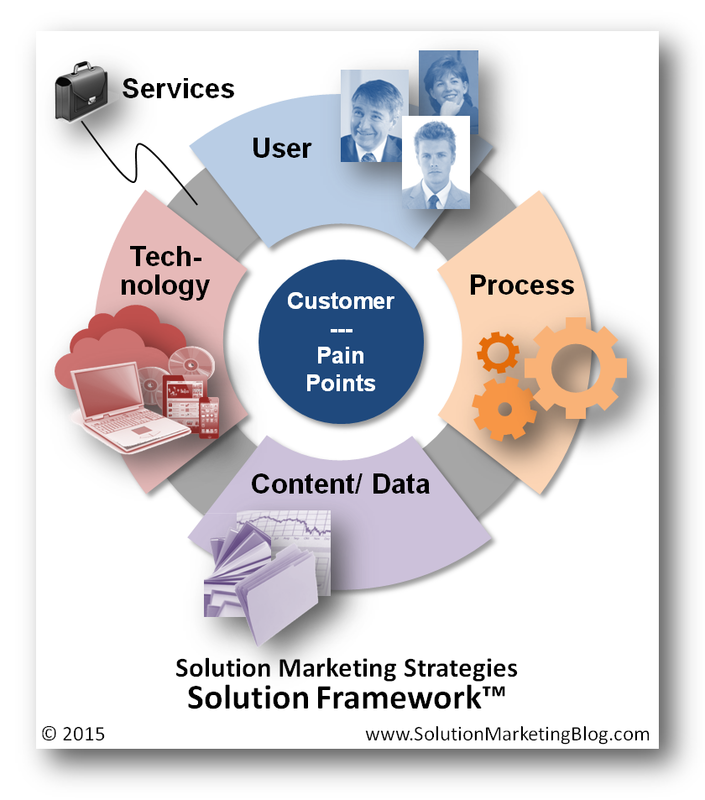 As a solution marketer, you need to stay ahead critical technology trends that may affect your solution and how you market it. For a while, we’ve been hearing that mobile devices would overtake desktop and laptop devices. Yes, more people surf the web using mobile devices than desktops or laptops. And the mobile shift is happening in more and more ways. Let’s take a look at a recent example (as in yesterday!) – Cyber Monday. In late November 2005, The New York Times reported: ‘The name Cyber Monday grew out of the observation that millions of otherwise productive working Americans, fresh off a Thanksgiving weekend of window shopping, were returning to high-speed Internet connections at work Monday and buying what they liked. That and the fact that you can’t be both at your desk and in a physical store at the same time. 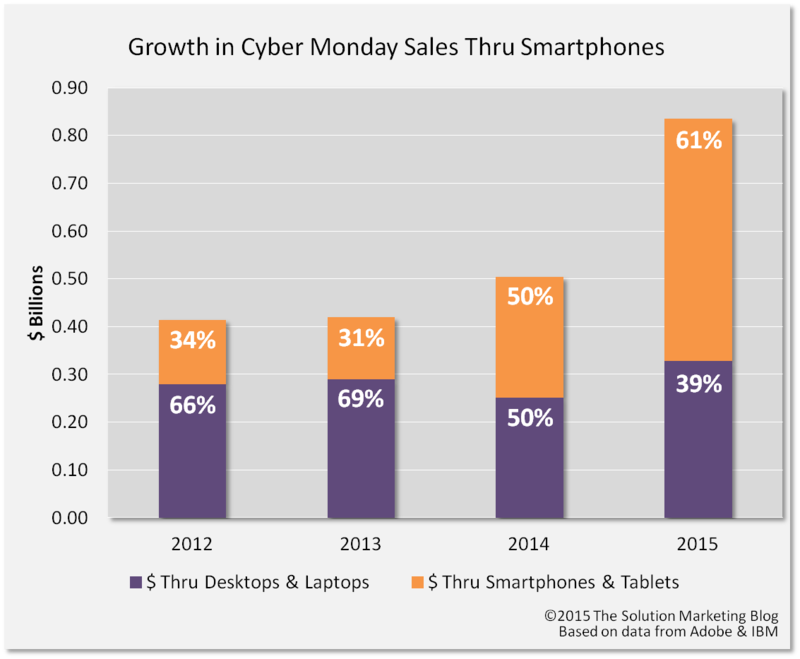 Cyber Monday 2015 saw an avalanche of sales through mobile devices, especially smartphones. 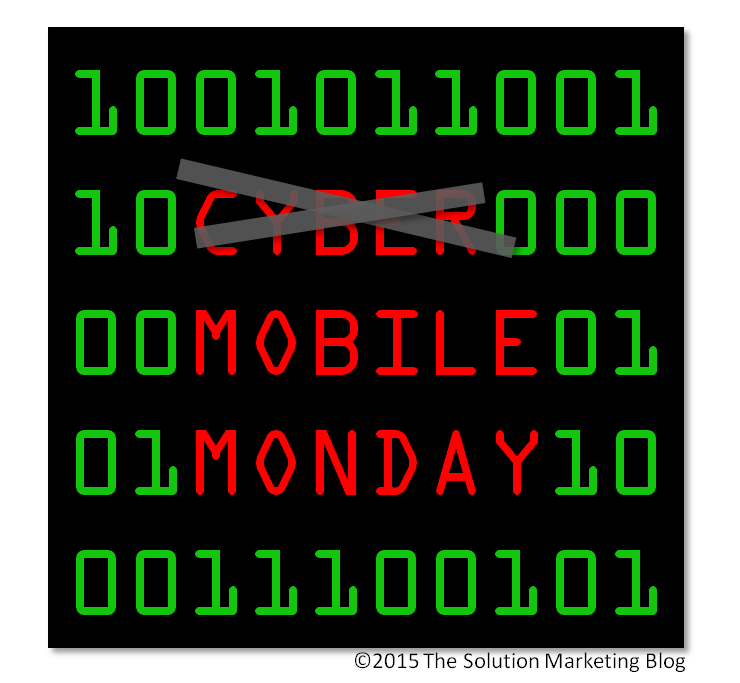 Mobile now accounts for 28% of Cyber Monday sales, with smartphones accounting for a whopping 61% of that number. Interestingly, tablets have declined from about 66% in 2012 to just 39% of sales today. 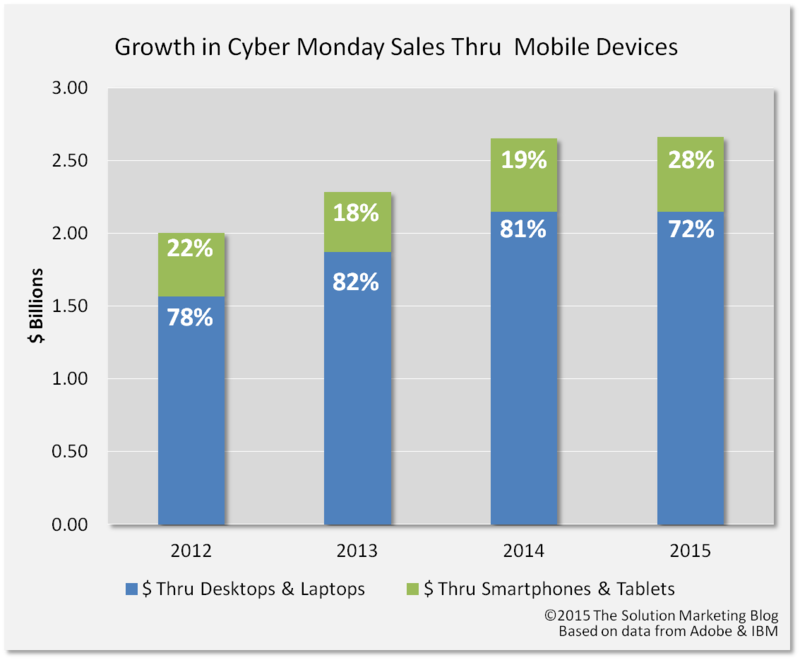 What’s more, according to Adobe, some 49% of Cyber Monday online visits took place through mobile devices, up from 29% in 2013. Maybe that’s why IBM and others added the moniker “Mobile Monday” last year. Of course, the massive switch to mobile is driven as much by increasing smartphone penetration, larger phone screens, secure mobile payments, and an improved mobile shopping experience. Mobile shopping makes more and more sense today. 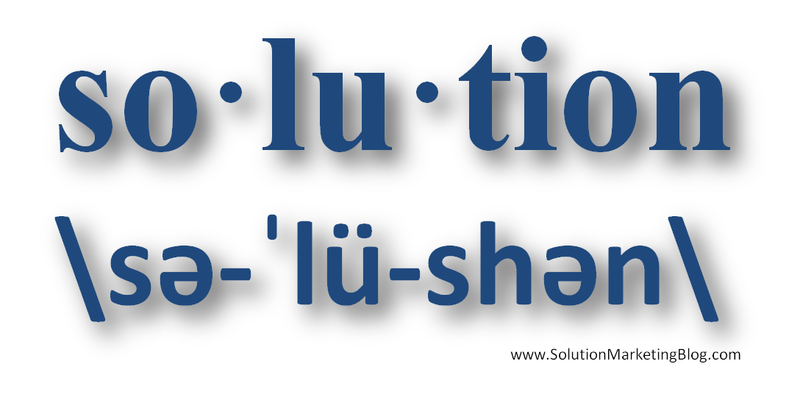 The shift to mobile won’t happen for all solutions of course. But looking back, say 10 years, who would have thought that so many of us would be shopping on mobile devices today. What is clear is that more and more, solution users will expect a quality mobile experience, even in B2B environments. They’ll expect it both in the way they experience your solution, and in the way that you educate and engage (aka marketing) with them. Mobile is here and of course, it’s not just a fleeting 1-day experience or a consumer-only experience. Rather, we’re living in the era of mobile 365. What do you think? How is mobile changing your solutions and how you market them? Black Friday offers an important lesson for cyber (i.e., enterprise software) solution marketers. Over the last few weeks, we’ve been bombarded with a never-ending stream of Black Friday TV commercials. These included a litany of TV commercials for BMWs and other cars on sale for Black Friday. Maybe it’s all due to a surge in self-gifting, although experts were predicting a drop for 2014. In a world where everything from clothes to cars was on sale on or around Black Friday, retailers were competing against just about every other retailer for the $381 that the typical shopper spent this past weekend, according to the National Retail Federation. That included direct competitors offering similar goods, indirect competitors who offered different goods that solved the same problem (say, giving a nice gift) and what I’ll call Share of Budget competitors who solved different problems but competed for the same budget. A few weeks back, I had the opportunity to teach a one-day solution marketing class at the Boston Startup School, located in the Harvard Innovation Lab. You don’t have to start a company to be an entrepreneur. Entrepreneurship is a mindset. It’s a healthy discontent with the status quo that brings together teams dedicated to making the world a better place. Entrepreneurs include all members of a startup team, from the CEO to the summer intern. Where’s the Customer at Sony? In order to offer complete solutions, companies need to come together around a shared vision of the customer, their challenges, and ways that the company can help. 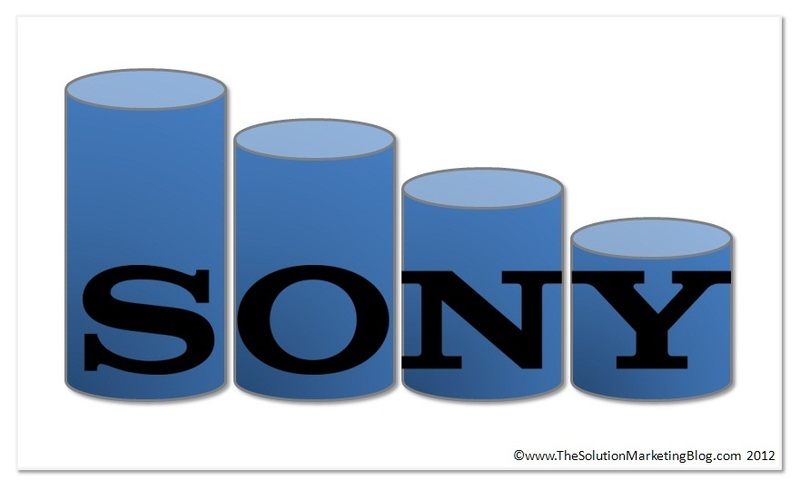 Companies like Sony and AOL Time Warner have been hindered by competing divisions often focused on divisional goals at the expense of the company. By contrast, Apple unified around a common vision of the customer, and a view of a complete solution spanning hardware, software and content.